To help keep you electronically connected, the Samsung Galaxy Tab features the ability to create and send your electronic missives. You can compose just about anywhere you go. Crafting an e-mail epistle on your Tab works exactly like creating one on your computer. Start an e-mail app, either Gmail or Email. It’s the same icon for both apps, as is the Compose window. You can type the first few letters of a contact name and then choose a matching contact from the list that’s displayed. Or you can touch the Save Draft button, and the message is stored in the Drafts folder. You can open this folder to edit the message. Touch Send to send it. Copies of the messages you send in the Email program are stored in the Sent mailbox. If you’re using Gmail, copies are saved in your Gmail account, which you can access from your Galaxy Tab or from any computer or mobile device connected to the Internet. To cancel a message, touch the Trash button. Touch the OK button to confirm. 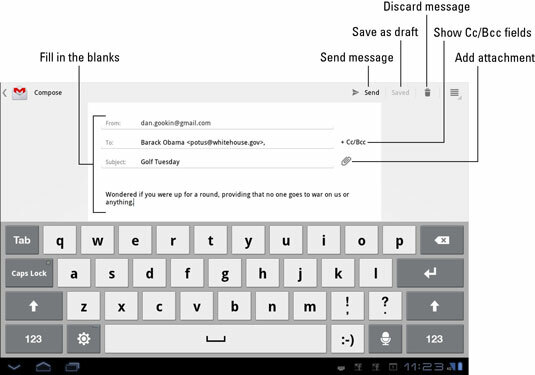 Choose Gmail to send the message using Gmail or touch Email to compose an e-mail message using your main e-mail account. At this point, creating the message works just like creating an email from the Email app.